Writer and barker. Bite is worse. Most compelling of all were the short audio clips from the oral histories of now-elderly niños reflecting on their experiences as refugees in England in 1937. “… a powerful and inspirational film about the loss of childhood, the stripping away of identity and, ultimately, the hope of reconciliation, all set against the backdrop of the Spanish Civil War. Through innovative animation, the film tells the story of the 4000 Basque children evacuated to the United Kingdom in 1937. Forced to bid a hurried farewell to their parents, these children were told they would only be in the UK for three months. 75 years later, some are still there, forever separated from their parents and their homeland, their families torn apart and their childhood destroyed by a brutal and bloody conflict. I couldn’t wait to chat with Izaskun following the screening, and when I emailed her she very generously agreed to answer a whole bunch of questions. I thought this ‘interview’ might shed light on the inspiration behind my own two-year obsession with this story, and so with her permission I reproduce it below. ‘To Say Goodbye’ was such a moving film, and I’m so pleased and grateful that this extraordinary testimony has been brought to life in such a powerful and accessible way. What made you choose this story, and how did you decide on the best way to tell it? Izaskun: In the Basque Country we all know about the evacuations, so I was aware of this story in general terms. But what I did not know was that approx. 250 of the 4000 Basque evacuee children stayed in the UK for good. I found this out while watching ‘The Brits Who Fought For Spain‘ by Matt Richards (dir. To Say Goodbye) and it immediately prompted me to question: ‘Where are these children now?’ And I went online and did my research and bumped into Alicia’s/Padmini’s project. I knew there was a story there and the story was a fiction piece in my mind. The switch to non-fiction came when I heard the recordings and I knew then that those voices had to be in the film. 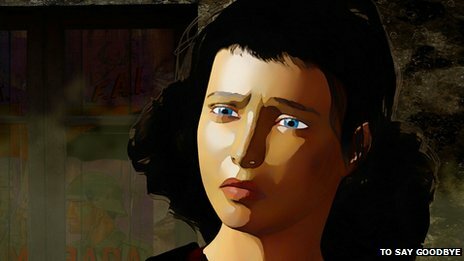 The only way to visually describe their childhood was by using lots of dramatic reconstructions (which I wasn’t keen on) and so the director came up with the idea of animation after watching ‘Waltz with Bashir‘ by Ali Forman. The footage of the children’s departure from Bilbao, overlaid with the voices of the now-elderly refugees recalling the parting from their parents, is simply heartbreaking. Did you get the chance to talk with any of the niños themselves, and if so, how did this affect the making of the film? Izaskun: I spoke to all the protagonists (except Alvaro Martínez, of course, who passed away a year or so before starting this journey). I wanted them to know who was going to bring their story to the big screen, I wanted them to trust me and to install that trust in them that I was going to care very much for their story. That their story was safe with me basically. To feel that they trusted me was hugely important to me, and very motivating to overcome all the difficulties that came up in the production of the film. Some of the niños had not even told their families what happened to them those years ago and so we all went on this journey together: the niños, their families and us the filmmakers. What kind of response have you had in Spain to the film? Izaskun:It’s had a great response in the Basque Country. It got distributed in cinemas all over the Basque Country and it’s now being distributed to school children with an educational programme. Unfortunately we haven’t had any distribution in Spain…. I notice you make a distinction between ‘Spain’ and ‘the Basque Country.’ One of the reasons that the Basque Country allied with the Republicans against Franco, despite being largely conservative Catholic, was because the Republic had pledged to honour Basque autonomy. Following a hotly-fought referendum over Scottish independence here, we are watching events unfold in Catalonia with great interest. What is the current political temperature in the Basque Country on this issue? Izaskun: We are also watching events unfold in Catalonia!!! Leah Manning moved heaven and earth to get the niños out of Bilbao to England, but the price paid by those who remained here was high – many never saw their parents again, most talk of confused identities and a feeling of being ‘neither one nor the other.’ Do you think it was the right thing to do to evacuate the children without their mothers, and do you think the niños themselves believe so? Izaskun: I don’t think you know what to do until you get to this desperate situation. I have spoken to friends of mine who have children and they have all said they would have NOT sent them away. I do think that the niños believe this (emotionally) but when they rationalise why then they agree with their parents’ decision. I think it’s a heart over head matter. The Basque Children’s Committee here was put under enormous pressure to send the refugees back after the fall of Bilbao. But my guess is that many more of the refugees who ended up elsewhere, Russia or France, ended up staying there than stayed in England. Do you have any sense of how this story fits into the story of the wider Basque diaspora? Izaskun: From what I have learnt, other evacuations had a very different outcome because the circumstances were different (the UK niños had to go on their own, no parents, other evacuations let parents – or at least one parent – accompany the children, and other governments were more ‘helpful’ than the English – particularly the Russians, as the evacuees were received as heroes, political refugees). I think you steered a careful course in your film between criticism of the British Government which refused not only aid to the refugees, but assistance to the Spanish Republic; and praise for the ordinary British people who worked so hard to offer help. How do you think such a crisis would be met today? Izaskun: I honestly don’t know the answer to that question. And it is a question I have often asked myself, not only while making the film but also after. I’m not sure how any ‘developed country’ would cope in a situation like this and this makes it even more extraordinary that the UK people, with far less resources than we currently have, managed to do what they did in 1937. Unfortunately, children are still being displaced and evacuated, see Syria, Afghanistan (although I don’t think in such large numbers). I think nowadays everything is moved (and excuse my cynicism) by financial interests so the answer to your questions would probably be another question: Where are the children from? A general sort of question to end with – what message would you like your audience, English or Spanish, to take away from the film? Izaskun: That war is a terrible thing. And that the most affected by it are innocent adults and children. I would like the British audience to take away the hidden THANK YOU message, because the British people did an extraordinary thing by hosting all these children. Thank you Izaskun, and wishing you all success with your film. Trailer for ‘To Say Goodbye’: tosaygoodbyethemovie.com. This entry was posted in Spain, WIP and tagged basque children, franco, izaskun arandia, los niños, refugees, spanish civil war, to say goodbye. Bookmark the permalink. « Take His Hand. Guard His Heart. Take His Hand. Guard His Heart.